Berwick manager John Coughlin admits his side need to improve dramatically if they are to climb away from the foot of the table in the new year. Rangers now find themselves in a relegation dogfight after a Christmas Eve defeat at Annan. The loss means Rangers went into the festive period just one place and two points off the bottom of the Scottish Second Division, making Saturday’s home match against Edinburgh City vital in their fight for survival. “We had hoped to take something from the game at Annan so it would give us a happy Christmas,” said Coughlin. 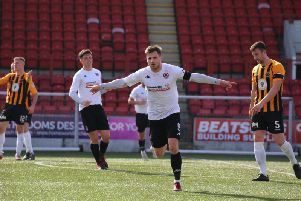 Galabank has never been a happy hunting ground for the Shielfield side, and with all the goals coming in the first half they struggled to get a foothold in the match. They fell behind after only five minutes when David McKenna shot past goalkeeper Shaun Brennan after taking a pass from Max Wright. Berwick got themselves back on level terms after seven minutes, loan signing Pat Scullion turning the ball into the net from close range following a corner by Steven Thomson. Play then swung end to end, but it was Annan who regained the initiative when Peter Watson headed home after 30 minutes. And it soon became 3-1 (on 39 minutes), when the Rangers’ defence failed to clear and Omar found the net. Early in the second half both sides had shots from distance which went over the bar, whilst Annan’s Barry Cuddihy somehow managed to lift the ball over the top when it looked easier to score. “It doesn’t get any easier,” admitted Coff, whose side will face another big game against Edinburgh City at home on Saturday. Additionally, Season Card holders from Edinburgh City,Hibs and Hearts will save £5 on production of their card at the concession gate, turnstile B.